I would like to extend a personal and heartfelt thank you to the women in the Syrian Arab Army . These women are our mothers, aunts, sisters, and daughters that selflessly took up arms to protect their families and country. “We came to fight by our own volition. We knew that it would be difficult, but still we came,” one of the servicewomen told RT. May God protect these amazing women that risk their lives daily to protect my birth country, heritage, and my family back in Syria. Thank you for fighting against the terrorists that invaded Syria and started this bloody senseless war almost 7 years ago. This imposed war has resulted in hundreds of thousands of deaths, millions of refugees, billions in destruction including priceless historical monuments such as in Palmyra, the destruction of beautiful mosques and churches, homes, schools etc. Contrary to popular belief (which is becoming less popular with each passing day as the truth reaches more people) the war in Syria did not begin as a revolution which then turned in to a civil war. From the onset, this was a carefully planned and executed invasion and imposed war by foreign nations. What many might not know is that Syria is a country that selflessly took in Iraqi refugees without papers and Palestinian refugees by the tens of thousands from 1948 onwards. Many nationalities have sought refuge in Syria and were made to feel at home. The Syrian government stood up for Palestinians against “Isreal” more so than any other Arab country. Syria was let down by its neighboring countries with terrorists flooding in through the borders of Turkey and Jordan. A country whose strongest allies are not even Arab except for Hezbollah which comes from Lebanon. Russia and Iran have stood by Syria when other “Arab” nations tried to bring about its destruction. Please keep these brave ladies and all of the amazing warriors in this war on Syria in your prayers. 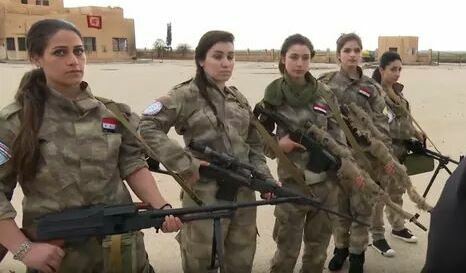 “A battalion of female volunteers conducted military training south of Damascus, Tuesday, in order to “protect the motherland” from Syrian militants, according to one of the volunteers. The battalion known as Al-Mahavir is made up primarily of female fighters who have joined together in order to quell militant expansion in their country. You can follow me on my social media accounts, by clicking on the hyperlinks below for daily news, updates, discussions, etc. Thank you Sarah for this post.I was not aware of the female battalion in Syria.The Syrian people are very brave and loyal to their country .I would say that you are right up there with Vanessa Beeley and Eva Bartlett with your truthful reporting. Sarah, you are doing a great job, the West cannot suppress the truth anymore thanks to individuals like you. Truth will Triumph!, fear not. Keep it up. Best wishes from Canada. Thank you Jay! I really appreciate your kind and encouraging words.